Every once in a while, (and sometimes each day) I listen to a great podcast, enjoy an article, or see a good video that I want to share with you. 1. I recommend this NY Times portrait of a man who really cares about the message your grammar conveys. The article was a fun read that touched our texts, our emails– wherever it is tempting to sacrifice style for speed. 2. Also, I just discovered this podcast that is pretty good for background on interesting WSJ tech articles. You can feel the enormity of the gender shift in Congress when you see this recreation of a NY Times special section. A shift during 2011 was almost equally significant. In 2011, women in the House finally got a restroom near the Speaker’s Lobby. Do note that before then, female Representatives had to jog (so as not to miss a vote) to the Lindy Claiborne Boggs Congressional Reading Room. In 2007, the House decided against adding the ladies restroom near the legislative chambers “because it was too expensive.” (Would they have said that to the men?) I have always believed that the number and nearness of restrooms can reflect power. All week I’ve been pondering a Hidden Brain podcast called “Yum and Yuck” that looked at the psychology of food. But what got me was three words: Anticipation, Experience, Memory. First we anticipate a meal, then we experience it, and after, we remember it. And because some of us are anticipation people while others care more about the memory, we perceive food differently. I am an anticipation person. You? Do listen. Last week’s episode of This American Life is up there in my list of the best all time podcasts. In three “acts,” about three different libraries, in rather unexpected ways, it conveyed what a library can be. This update and correction take us back to the NASA shutdown. They changed their minds after the New Horizons successful flyby and publicized the event. 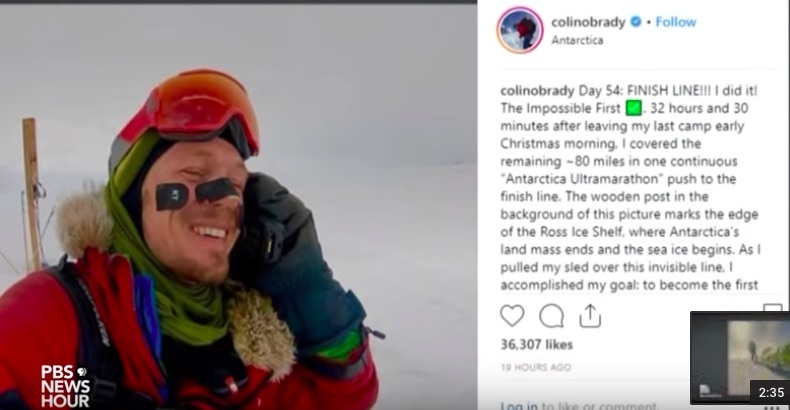 Several weeks ago we looked at the resources Colin O’Brady needed to be the first person to cross Antarctica alone and unaided. The story of the end of his trek–my best read this week–is here. Now at 48.3 million views, the Westjet “Christmas Miracle” video from 2013 is wonderfully indescribable. Every year I return to watch it. The title of this NY Post article, “The pizza scam you probably didn’t know about” says it all. Yes, our local pizzerias could be deceiving us. Do read the article. It was this week’s favorite. The podcast that I especially enjoyed this week is from This American Life. About two North Carolina physicians with the same last name, one at a clinic and one in jail for murder, the story is captivating. I walked an extra mile this evening to finish it. It has been such fun following the Swiss vote on cow horns. WSJ had the best description and the results but it might be gated so here is the alternative from the NY Times. Do note that that the urban vote almost swung the referendum on a farm animal. Sticking with animals, I selected “When Dogs Fly.” as the best podcast I’ve heard in awhile. The discussion focused on the animals people bring on planes. You will be amazed. Every week I look forward to a new Econtalk from economist Russ Roberts. Looking back at more than a decade of his podcasts, I recall two that especially had the perfect synergy between the topic and an interesting person. During a summer’s walk in 2011, I loved hearing how a potato chip is made. I also particularly enjoyed listening to the owner of Laughing Stock Farm talk about the business of organic farming. During October, Brookings hosted an excellent panel discussion commemorating the 40th anniversary of airline deregulation. Starting with a look at the pre-regulatory flying experience and continuing through a slew of issues that relate to today, it was the perfect detailed update. You can download the podcast that I heard or see it here on YouTube. Oddly, the panel discussion starts at 36 minutes into the video. If you listen to just one segment of the three-hour panel, go to the beginning (at 37.42 minutes) where an MIT professor tells us about the world of flying before deregulation. Just an update today. McDonald’s might still have an impact beyond the hamburger. Interesting to think that our transportation infrastructure involves so many of us that we have demand for flightaware.com. My daughter used flightaware to know precisely when my flight would arrive yesterday. While it is especially handy for picking someone up at the airport, you can use it to follow a flight from its start to finish. To see how women, power, and the exclamation point are related, do take a look at this video. This Econtalk podcast is a perfect (and very interesting) contemporary and historic look at socialist communities in Israel. Spotlighting the kibbutz, it conveys the allure and problems of socialism as an economic system. Listening to this podcast, I especially enjoyed my four mile walk today. Long ago, you could buy a house from the Sears Catalogue. Sort of do-it-yourself, the house came in the mail. Even without the Sears bankruptcy temporarily dominating the financial news, I still would have recommended this 99% Invisible episode for a taste of what Sears had once been. I was charmed by this story of two penguins that were in love. Do listen to Dolly Parton singing about the 19th Amendment. One of 27 amendments in an album from More Perfect (Radio Lab), the Dolly Parton song is inspirational. Reflecting how musicians interpret the amendments to the constitution, the others vary. However, the concept is wonderful and well worth our time. The very best is from this French cartoonist who cleverly conveyed the tangible and intangible unpaid household work done by women. As I wrote yesterday’s blog, I remembered Emma. This xkcd cartoon is a delight. It was the perfect complement to my airline blog on the fastest way to board. As I continue listening to How I Built This, my favorite episode remains the half hour with Sara Blakely and the story of Spanx. From creating and naming her product to the clever ways she sold it (like having friends buy up all available at Neiman Marcus and then repaying them), her story is a good listen. I also recommend the Trade Talks podcast series from the Peterson Institute. The perfect source for anything on trade, it has the big picture and the good stories. Not always riveting, it is consistently interesting. The one Trade Talks podcast that I will always remember involved a Delta response to a massive tariff on a Bombardier planes purchase. My favorite podcast this week came from This American Life. I especially liked the second segment on Frank Borman (at 21 1/2 minutes). Now 90 years old, he looked back on his space flight with a wonderfully and surprisingly mellow outlook. I discovered a new podcast series that is based in Australia. So far, having listened to “Hot or not: the economics of beauty” and another on the Australian view of China, I would say it was pretty good. It’s nice to hear the non-U.S. perspective. My favorite podcast this week was from Crazy Genius, “Can We Extend Human Lifespans to 150?” Listening to the progress we have made toward living to 150, I was amazed, encouraged, and horrified. The issues are fascinating. As a teacher, I found this article unsettling for many reasons. This “shrink it and pink it” podcast was a good listen from New Hampshire Public Radio. Looking back at our Stacy Smith post on the preponderance of white male film critics, we can look forward to Rotten Tomatoes broadening its outlook. Among the podcast series that I listen to regularly, one of the best is 99% Invisible. Ostensibly about architecture and design, their offbeat stories are just plain interesting. Rarely mentioned, The Invoice was an odd book that grabbed me. Its protagonist is a man who works part time in a video store. Unexpectedly, one day he receives an invoice from his government for millions of Swedish kronors because of 39 years of happiness. What happens after that is fascinating and even somewhat funny. I guess it took me awhile to discover the 2011 documentary Jiro Dreams of Sushi but it was wonderful. I’ve also waited to see every West Wing episode (the first aired during 1999). But this summer I am really enjoying one-a-day. Then, I listen to the “West Wing Weekly” podcast where the stars, the writers and directors share background info. I also wanted to share this Revisionist History podcast episode from Malcolm Gladwell on Brown v. Topeka. Although it aired more than a year ago, and I’ve listened to many others, it stuck with me. A kidney bean tariff story from Wisconsin. One of the best non-economic podcasts I’ve recently listened to, this Rough Translation episode took me to a prison in Somalia and Anna Karenina. A firm by firm plastic straw update. Is it possible to count cats? This mother duck (with 76 or so little ones) will make you smile.